In September 2008, the nation’s attention turned to the Gulf Coast and a storm that would leave behind $30 billion in damage. Hurricane Ike became the third costliest U.S. storm of its kind, and the Federal Emergency Management Agency kept the media abreast of the government’s response using a studio that Phoenix Noise and Vibration helped engineer a year earlier. 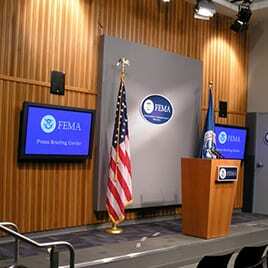 FEMA’s new press conference room required designers to overcome a number of challenges. 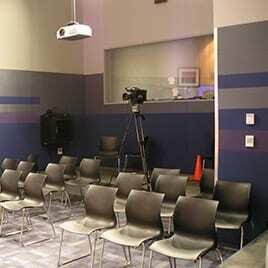 The space filled with microphones and touchy broadcasting equipment sits directly above a parking garage. It’s also adjacent to a busy lobby and large mechanical equipment. Donohoe Real Estate Services turned to our engineers for expert noise mitigation that could be executed within the strictures of a government contract that often required secrecy and careful adherence to federal rules. Phoenix Noise and Vibration’s pre-design analysis accounted for all sounds and impacts that might intrude upon press conferences. They included the challenging low-frequency shock of tires against concrete in the garage, car horns, lobby activity and motor noise from building systems – all of which would have to fall below a background-noise level established in the design. To accomplish that, our engineers provided complete room isolation. A floating floor filled with customized insulation halted garage noise from below, and a spring-isolated ceiling absorbed noises from above. Resilient walls sealed off sounds from the lobby, while duct lining and HVAC velocity restrictions kept mechanical noise to a minimum. Finally, our recommended acoustic design finished off the room by enhancing its natural sound quality. Post-construction tests confirmed that sounds from the garage, lobby and nearby mechanical equipment are now inaudible inside the studio. By adding acoustic enhancements and meeting the design’s scant background noise limit, the room offers FEMA officials high speech intelligibility and clarity when they address the cameras.